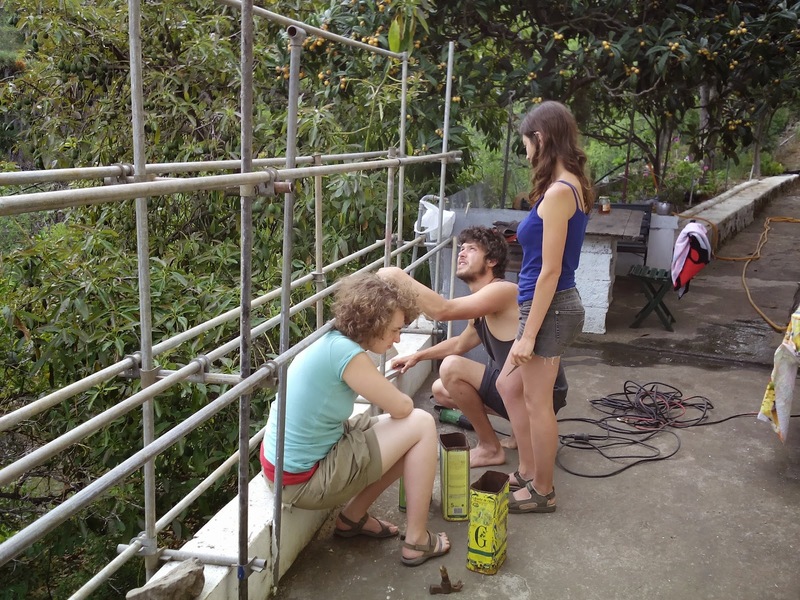 We've been trying out the new EcoEscuelas Network project since November 2014, perfecting the monthly iPDC program as we go with the help of our adventurous first Interns. We're delighted with the results of having smaller groups, since it means the students can take real responsibility for actually designing a creative hands-on projects whilst they take the classes on site. 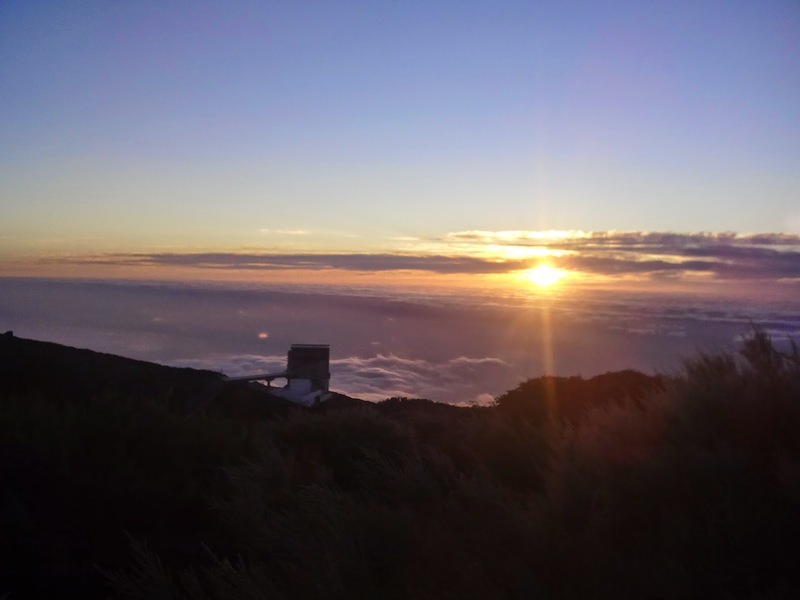 In this newsletter we focus on the experiences of some of the interns trying out the new course format in the 8thLife project in the Canary Islands, and some of the design work that has been done while they took their PDC* on site. This is an ongoing programme now, and we will be starting these internships also in Al Haman, in Almeria soon. Frida from Italy is the latest (and oldest, at 65) Intern at 8thLife, and we very much enjoyed her participation on the course from the beginning. Not just because of her positive attitude and excitement for learning, but also because, despite saying that she wasn't used to and didn't like using computers (needed for the online part of our courses), her enthusiasm for connecting & communicating was so strong that she made sure nothing would get in her way of building relationships. 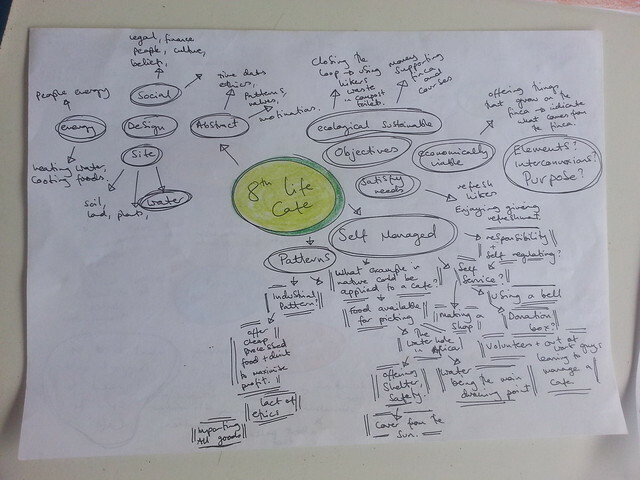 "At the moment you can come for an internship in 8thLife without having taken the theory classes, but my advice is to do the 20 classes before arriving on site, take the mind-maps you made during class with you and when you are here review or research in more depth the subjects that most interest you. 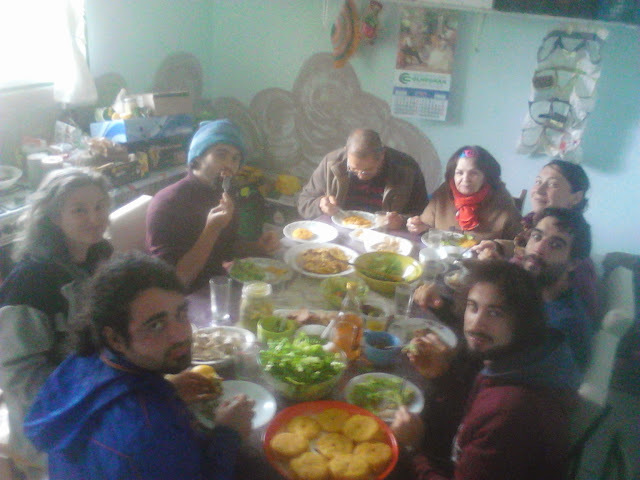 In this way you will make much more of your time here, you will have much clearer ideas about what Integral Permaculture is all about, and with clearer ideas you will be able to understand the project a lot better, design more things yourself & make more focused & more precise questions, and so learn much more." 1) the more conventional, shorter version, which can be done in 1 month: do the theory at the same time as the field work but not do so much of your own designs work - since real designing requires having a good grasp of the theory to start with, then ample time for observation, planning, doing, reviewing, etc. 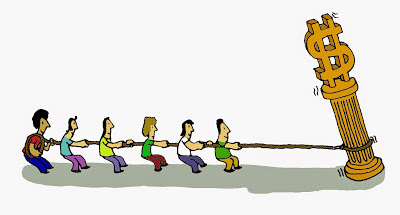 2) and the longer, more practical route which can be done in 2 months or more, and means arriving on site already having studied all the 20 classes of the iPDC, and understanding what designs are most needed at the place you will be doing your practicals and clarifying what you would be passionate about working on, so that you can enjoy doing more in-depth creative work there, in the wider context of a complex Permaculture project being created for future generations. 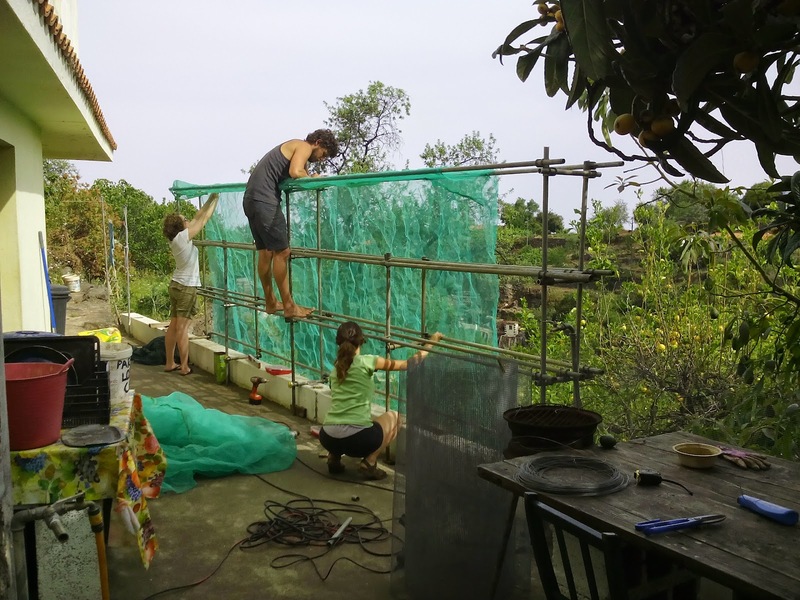 Of course just living and working on a permaculture farm or project can be an education in itself, but that depends a lot on how much you engage. For some it remains little more than eco-tourism. And the difference mostly depends on your preparation, which is why we encourage the online preparation, before arrival on site. 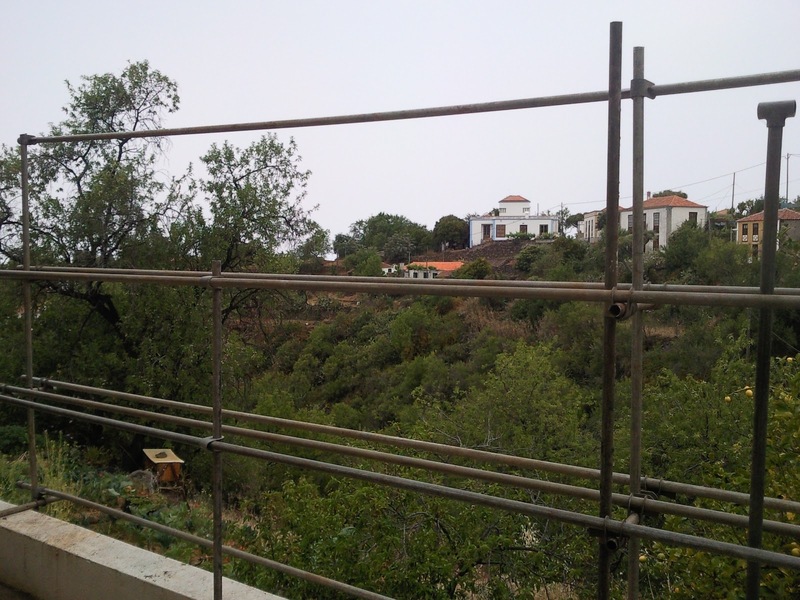 Everyone has the option of taking part in any or all of the regular farm maintenance tasks - working with animals, nurseries, gardens, forest gardens, repairing or building small structures .. which means interacting intimately with all the particulars of the complex design. But as an intern, you can also design them. Of course there is plenty of time to ask questions, solicit the stories behind each of the different parts of the design, but we are all limited (and especially the types of questions we think to ask are limited) by what we see and understand - by our previous knowledge, prejudices and filters. 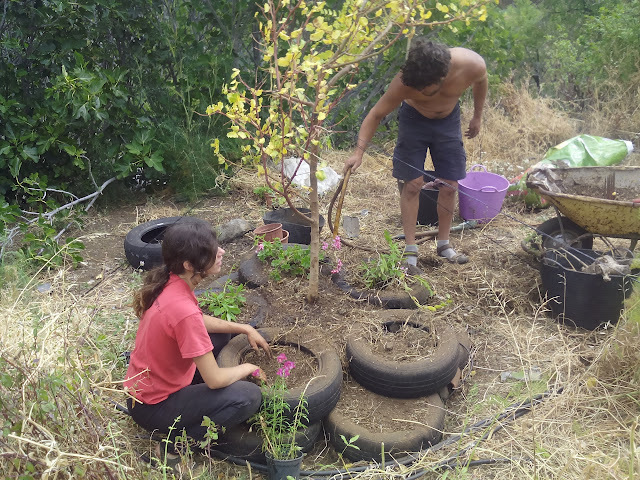 The Integral Permaculture curriculum is particularly designed to help us question all sorts of things we don't normally question - and which prevent us from being good, flexible designers, and to be fully empowered in our own lives. "I enjoyed the iPDC because it is amazing taking classes outside - as we can take the classes wherever and whenever we like, we re-designed these for ourselves to suit our personal wishes and the day we took this picture of me I was outside with Suzy doing her class in another language, instead of together inside like previous days, seeing the classes together, after I realized they were easier for me to follow in spanish. The E-Book is so full of information. I go there to look up whatever I am most interested in that I learn from the classes." 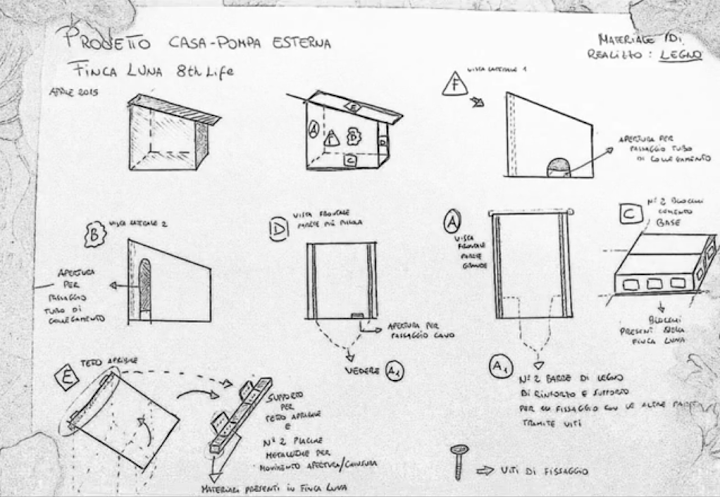 Daniele didn't do much online preparation beforehand so he didn't know what design practicals he was going to do. 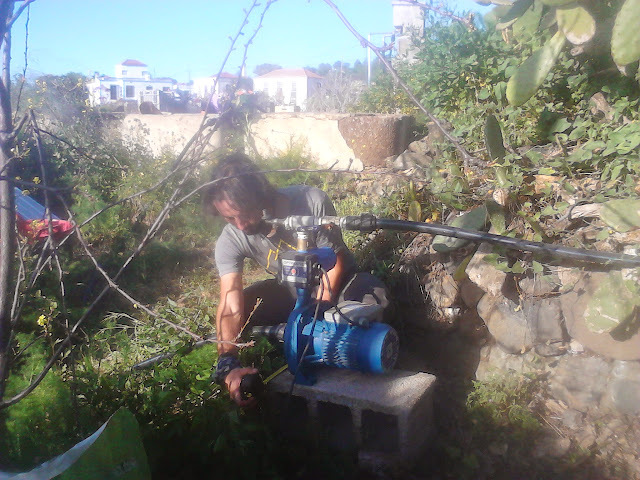 Because of that, he spent his first month trying out a few wild ecobusiness ideas, which we all enjoyed following as they were very creative, but as time ran on we had to find him a small enough project that he could complete before the end of the course - so he took on building the water pump house. 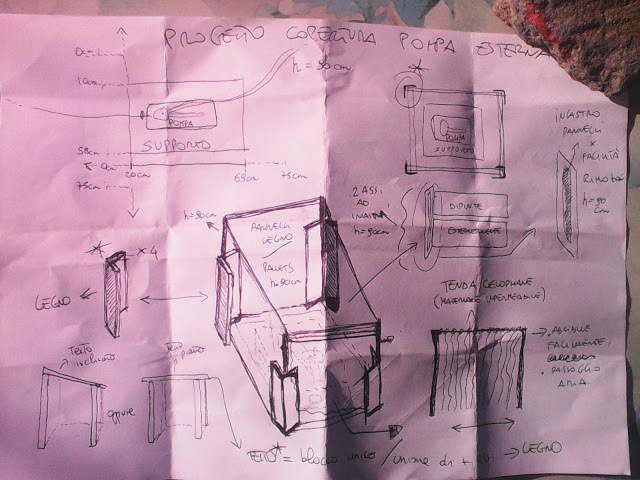 After a client interview, taking measurements and trying out the ideas for various recycled materials we had around the farm, he made various sketches. In the end we settled on wood as the main material, and tried to figure out how to give suitable space for all the tubes whist sheltering it both from sun and rain. We also needed to leave the pump buttons easily accessible for starting and stopping it manually, and the whole structure had to be easy to move out of the way if necessary - and we are very happy with the results, as it looks good and is very functional. Daniele pursued various creative ideas at first, with different materials, he was open to suggestions and asked various people for their opinions, didn't get discouraged when his first prototype didn't work out, persisted and knew when to ask for help although he worked mainly on his own - all good designer traits and skills. Daniele often entertained us with his beautiful guitar playing and singing, and was always cracking jokes & pulling pranks. But he also showed maturity in dealing with a few group conflicts, & was generally very helpful on the farm. 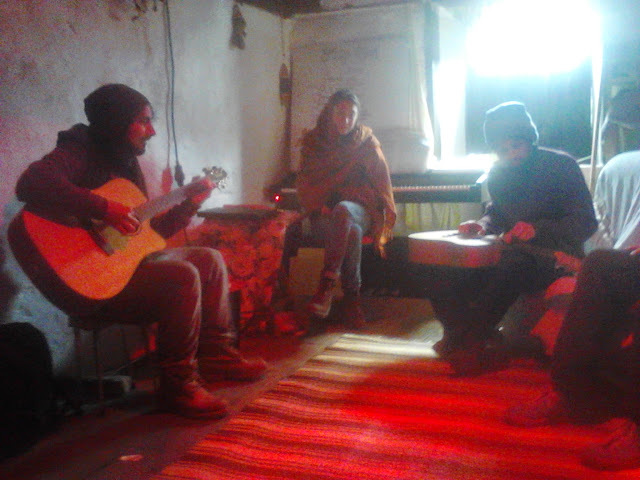 So we accepted - for his second design - a performance he organized with Fer: a song he wrote about the farm and his experience with us, with Fer cartooning as he sang. We enjoyed it a lot and it showed a lot of imagination and resourcefulness - all also key qualities for designers. entered an essay competition whilst staying with us. When he left, he traveled back home by hitch-hiking on sailing boats. We hope that some of the interesting experiments he made while he was with us for possible future eco-businesses will work out for him or inspire him further toward something that might work, since that is probably the most important personal design any of us will ever tackle: how to make an ethical, satisfying income (doing something we love) while being surrounded by the Destructo-Culture. 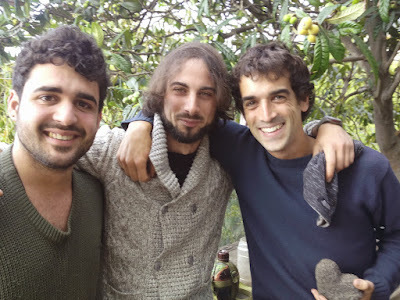 Fer from Spain did the course at the same time as Daniele, and said "It is really a practical course, it's flexible & the environment is perfect". Fer delighted us with his cartoons, which he included in all his design work. 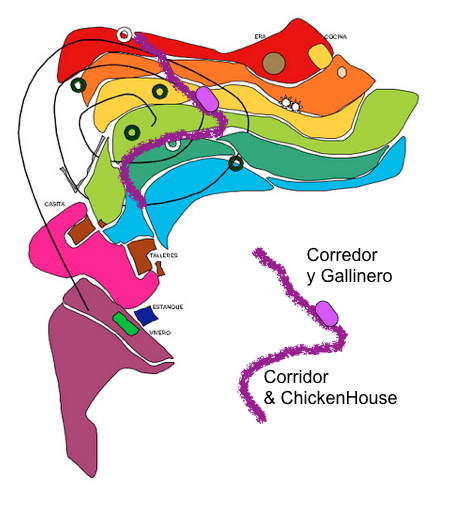 << He showed this one during his final design presentation, illustrating his 'client interviewing' (Fer is the guy to the right with the notepad & pencil) with Jose telling him about the importance of the chickens feeling safe. Jose has exactly that green old jumper, goes around barefoot and plays with his long sleeves in that manner - this kind of attention to detail is delightful, and the mark of an excellent cartoonist, as well as a very good designer. 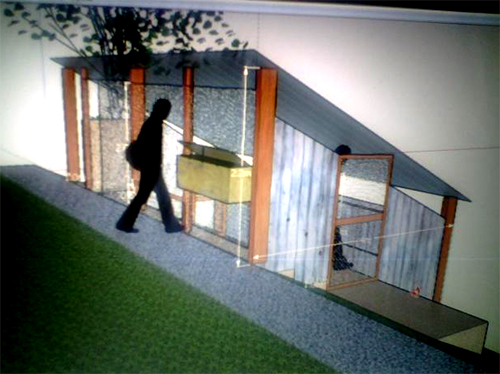 Although his main design project was the big chicken house - to which he made some important additions (THANK YOU!) - for the final part of the course Fernando found himself inspired to develop his artistic side during his stay, and after thinking about several projects to develop - one being a comic about his adventures transitioning to a more sustainable lifestyle - he started helping with the graphics for a bioregional design we are participating in, creating a beautiful poster and many illustrations for the project. better align their values to their life path. 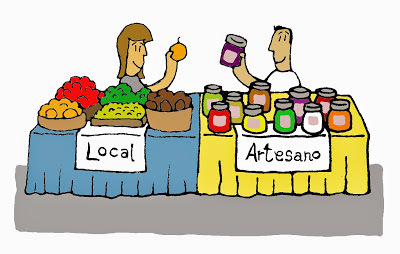 So we hope that Fer will pursue his idea of a comic about his adventures transitioning to a more sustainable lifestyle, and thank him for his beautiful illustrations. << This 'Facebook dialogue' picture gave us the idea of linking the pages of the Integral Permaculture Designers Manual which are being discussed in our Facebook group. This is a design project that many people have worked on for a long time here in 8thLife, with each person adding a piece of the puzzle. 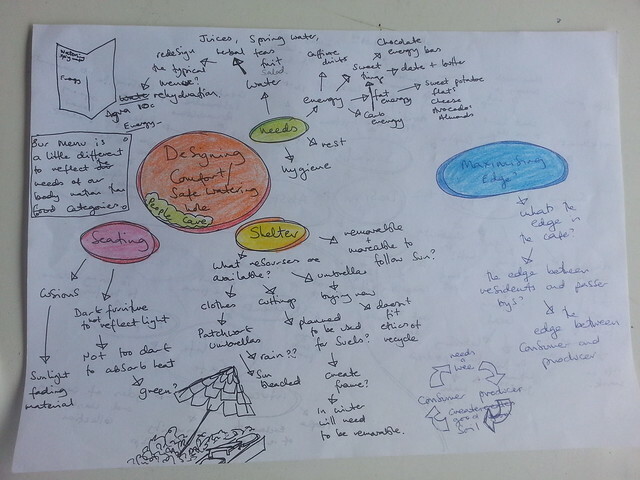 << this drawing made by Heloïse from France shows its structure and main functions. 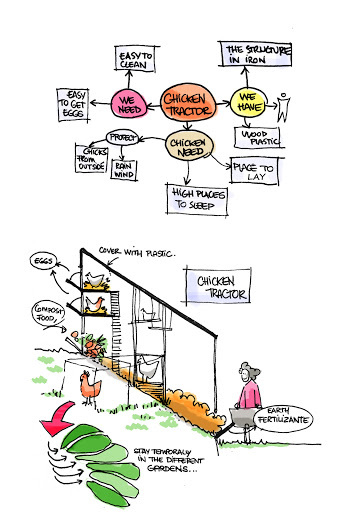 This is part of a bigger chicken tractor design, where the chickens will move every day from their house, in the center of the farm, though a system of corridors to the gardens, so they can work on one of them each month to enrich and prepare the soil for the next crops. 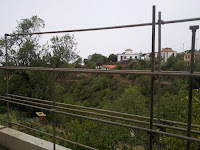 - to the right are the forest gardens). Now we've finally managed to move the chickens there, so now they're enjoying their new house. 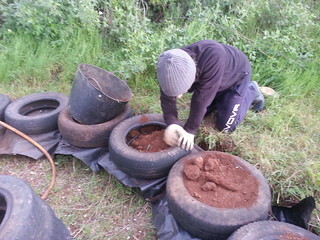 A core part of our mission is to improve the soil, and one way to do that is to stop soil erosion. By making mini-swales on the steep banks of the terraces we create little platforms were we put plants so their roots hold the soil. 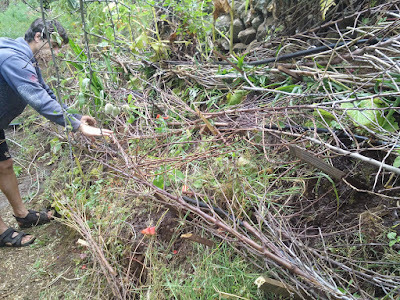 the finca with waste branches & compost. Other workshops Fer participated in were fermenting foods, making chocolates & making interesting dishes out of green bananas (which became a bit of a passion, especially the salty banana chips) and also weaving shades from the plentiful cane we harvest nearby (for the chicken house roof). 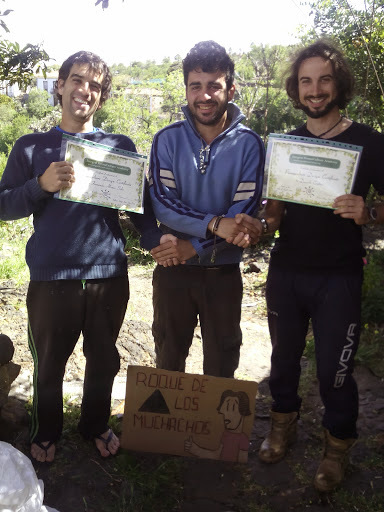 Giselle from Argentina & Emilio from Spain stayed for just a month, but managed to get 3 infrastructure projects finished as their practical design projects, while they took the classes for their Permaculture Design Certificate course, the iPDC. << Here they are helping to prepare a new larger potting area behind the library, where new cuttings and transplants start their way to the nurseries. 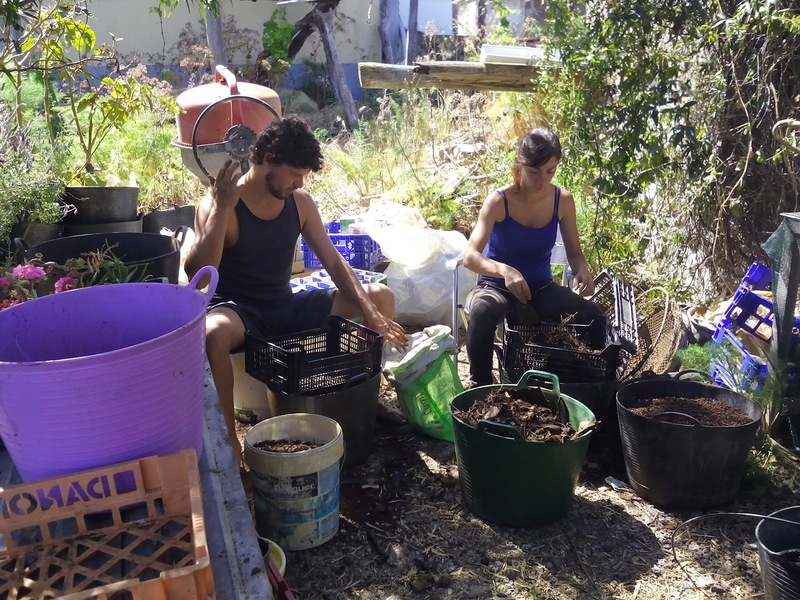 In this photo they are sifting soil, granzón & compost to mix in varying proportions according to the needs of each plant. 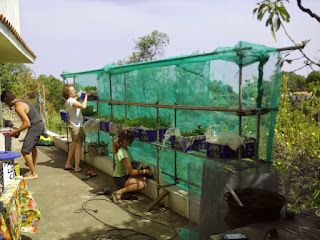 Jessie from Denmark also helped with designing the vertical greenhouse, as well as making some small beautiful changes around the new potting area, but had to cut her visit short due to illness in the family. We hope she will be back soon! 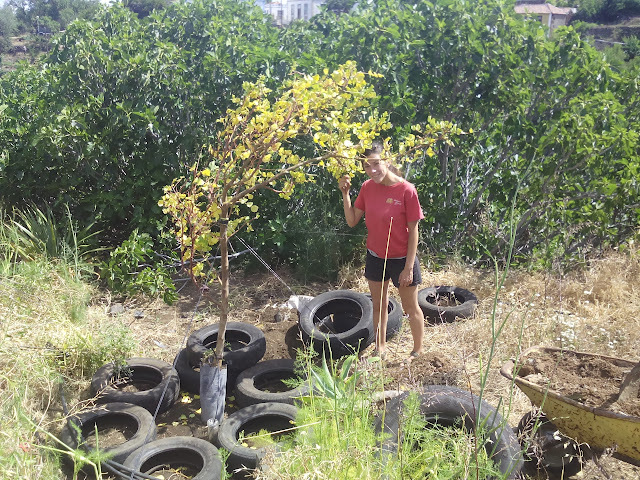 So, thanks to the recent interns, we now have three nurseries: a new one for vegetable seedlings, as well as an expanded one for other small plants, and another one for trees. 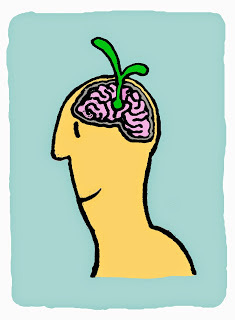 This below is one of the working sketches for the new vertical seedling nursery. on a low wall that was not easy to shade in summer and prone to lizard attacks (they can chomp through a whole tray of seedlings very quickly, and they love sunning themselves in stone walls). 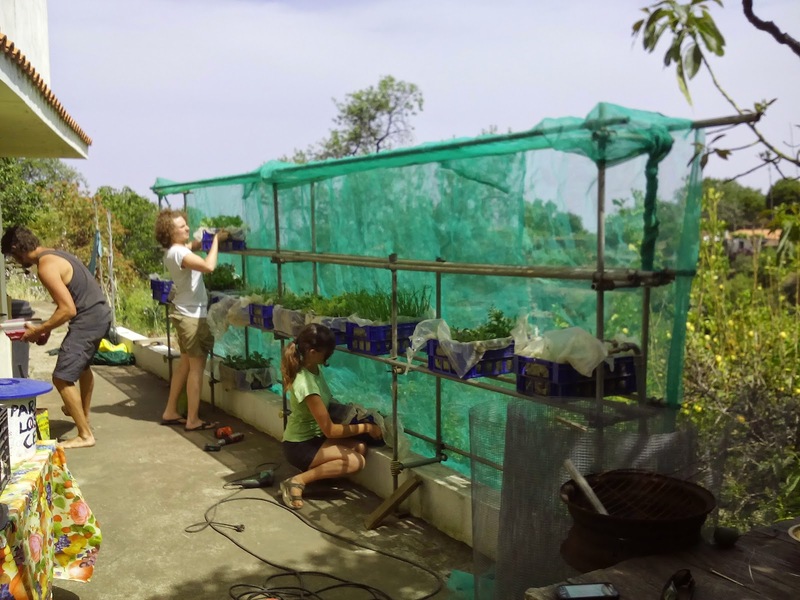 Jessie, Emilio & Giselle set out to design the structure & logistics for a vertical seedlings nursery that would multi-function as a green wall both for added privacy & extra shade for the Transition House patio. the nurseries in Zone 1 where we can keep a constant eye on the seedlings, and this corridor is quite busy, so it's a perfect location. This vertical nursery wall is something Celi had originally thought of and which we were keen to do also because it would provide a wall to prevent children falling off an unprotected part of the patio, as well as the other functions listed above. They worked brilliantly as a team (Emilio wanted to practice team facilitation so this was his part of the design) and the structure made from the materials of the old nursery, which looked very different, was up in just a few days. We are very impressed with what this dynamic team of young people achieved in such a short time, and very thankful that we now have a much larger and easy to shade area for our seedlings to grow in: a lovely and very practical green wall. In this video you can see them presenting this design. but it was leaning to one side. 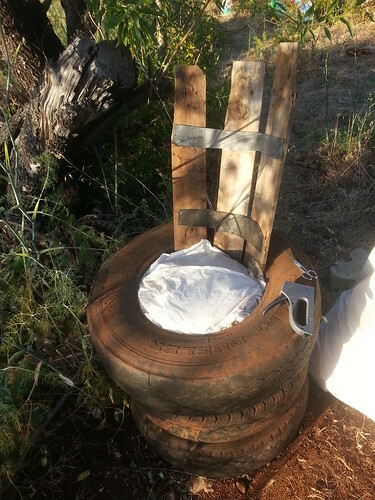 so Giselle made a great tire structure around it to hold it in place, and she also added more plants & flowers to make it look even more beautiful. In the video below you can see the presentation of this design. 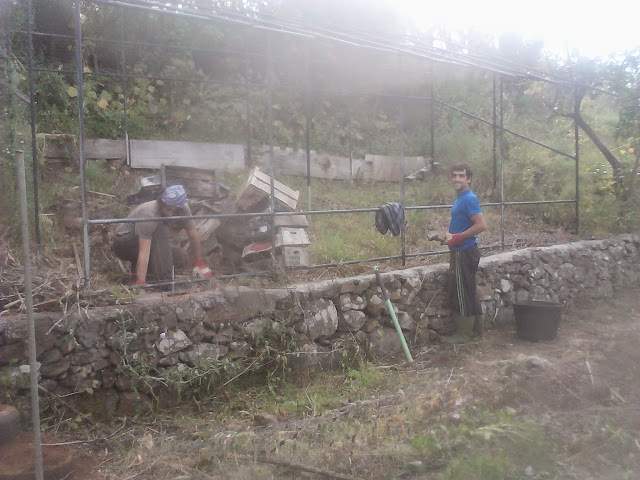 And the third project completed by Giselle and Emilio was the new pig pen for our two lovely black Canarian pigs. 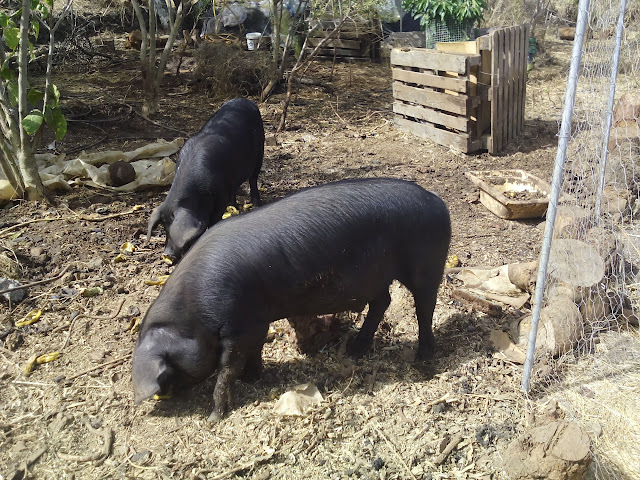 The pigs had already fully tractored their old home, so we needed a new space for them, and we were also looking forward to having them closer to the main house so we could interact with them more easily. 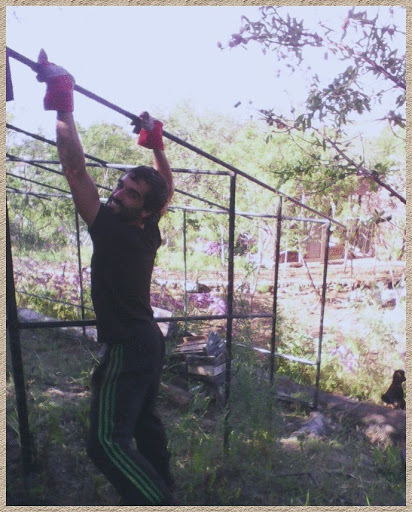 Emilio used his excellent building skills to build a fence and welded two new doors, after a short welding workshop by Jose, and we all did our best to make it 'pig proof' by pinning tree logs around the fence to stop them digging the base. So now the pigs are now having fun in their new house, which we are all very happy about. And in this video you can see Giselle & Emilio presenting this design. 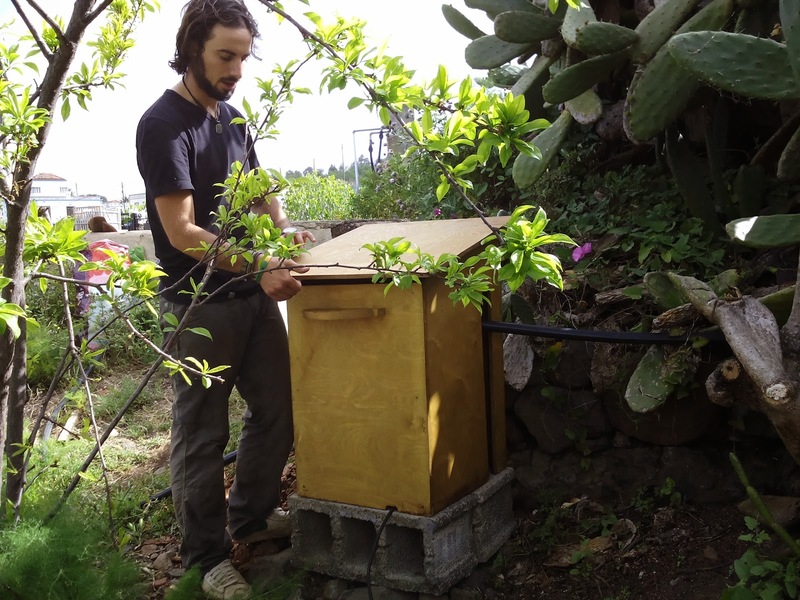 David in Spain, is a student of the online version of the course, who enrolled because he wanted support in developing his family farm and nursery ecobusiness. He also presented two of his designs to complete his PDC and is now continuing on the Diploma pathway. 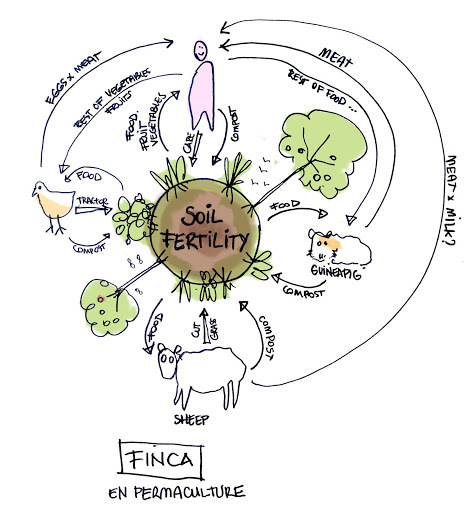 The second design he presented was the progress of his biointensive garden, where he has been busy regenerating the soil and also advancing the creation of a future food forest and nursery ecobusiness base. 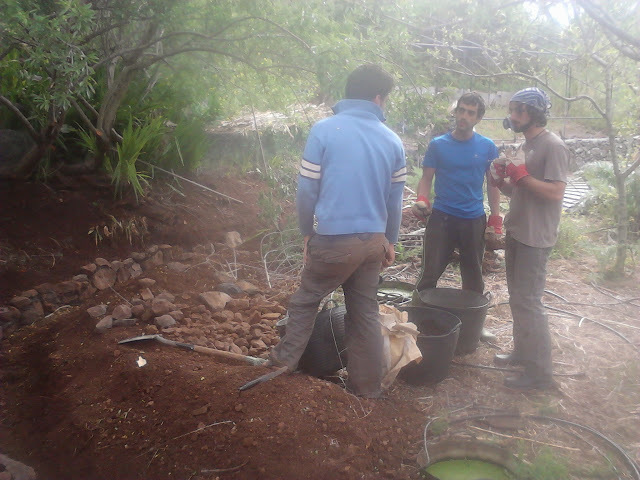 "With a Permaculture design course of two months and a half under my belt, and an additional three months as a volunteer in the Montsant Permaculture institute, when I came back home I just wanted to keep learning Permaculture, especially when I realized that I still didn't know where to start. I considered the possibility of doing a permaculture action learning course on the Internet, but my first feeling was of backing out, because I didn't think that learning Permaculture on the internet could be at the same level as an in-person course. 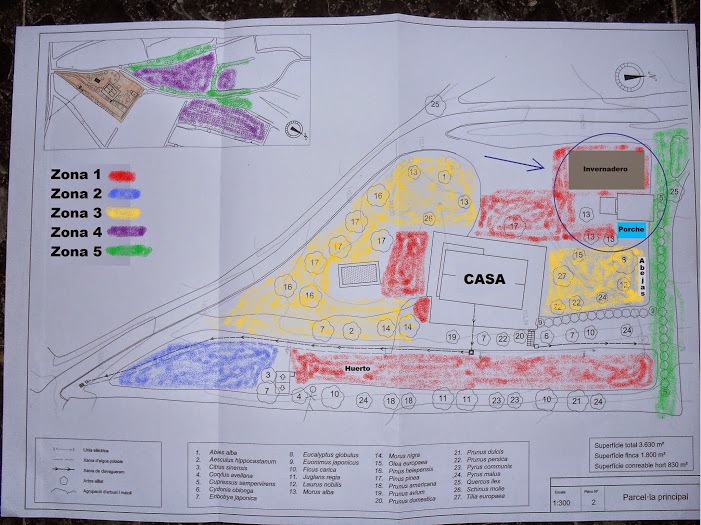 But I was partially wrong, because when I started the course with the Integral Permaculture Academy and saw its functioning and the community that's behind it, I've realized that the learning and personal growth that I can undergo are similar, if not better, than with an in-person one." And for his design presentation, he researched some tools and made a great video. 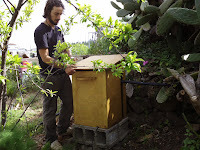 and he is also researching and experimenting with his diet for integral health and wellbeing, developing his knowledge & skills as a bee-keeper and as a grower of nursery plants and organic preparations. Suzy from England, stayed in 8thLife as an intern for 8 months and took on the challenging roles of being our very first Volunteer Coordinator and later Hostel Manager, as one of her aims was to develop her leadership and coordination skills. All of this whilst working on a variety of designs with much enthusiasm and creativity. 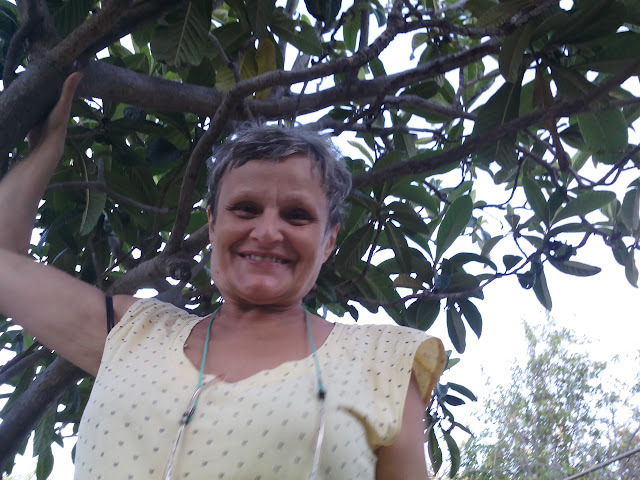 She also started exploring a possible future career as a writer whilst with us, as she started selling some of her articles to the Elephant Journal, which were inspired by her experiences in 8thLife, her discussions with the people there and what she has been learning in the iPDC course. 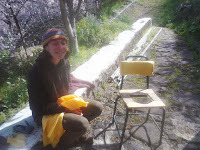 In order to support herself financially whilst living with us, Suzy had the idea of selling home-made muesli bars to passing tourists (the farm is by a walking route). This worked well enough for her to earn some regular weekly pocket money. and the idea organically developed into a Café experiment. designing a menu and presenting it in a renovated blackboard, sowing some shades to protect the patio from the sun in the summer, and planting more herbs in the planter besides the café. She also made some good observations for the next person to take on this design to keep moving it forward and grow it into a budding EcoBusiness. Before leaving Suzy had the idea of making a short documentary of the EcoVillage project. She designed the storyline, interviewed people, made some animations and interspaced stills and video footage of farm routines in the whole. She is now editing and the final draft will be published soon. During her internship Suzy also built the foundations of one of the Hobbit Domes, completed a few tire staircases, and did other interesting experiments, learned to lay watering systems and installed the deep irrigation for young trees in nearly all of the forest-gardens, she made a very nice portable compost toilet and in one afternoon invented a new type of chair made from 99% recycled materials. Suzy, like Fer, is one of the interns who took the opportunity to research and experiment with her eating habits whilst with us. 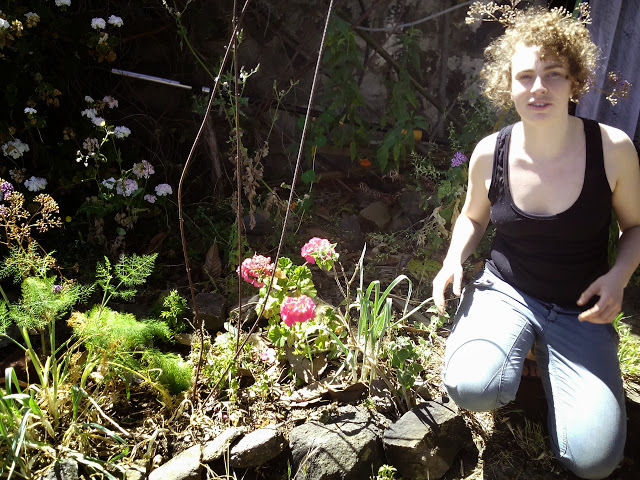 This led her to make some interesting discoveries about how to improve her health & wellbeing. 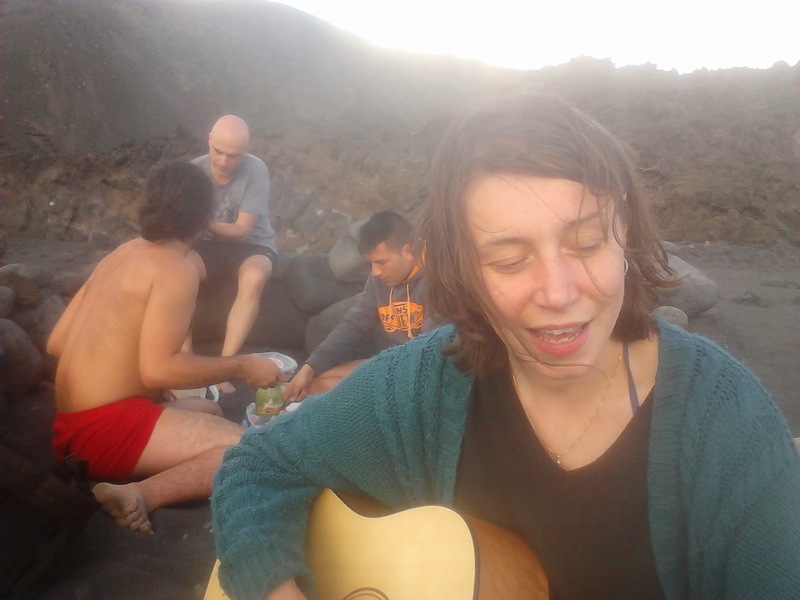 All of this in between delighting us with her many other talents, like playing the guitar and piano, singing and teaching us songs. Thank you Suzy for everything! It's been wonderful to have you here, and we look forward to having you as an external facilitator for the next groups of iPDC students, and to see your progress as a Diploma student. We encourage students to propose their own original, multifunctional, educational and inclusive Design Certification presentation and ceremony, since this is a very useful practice in designing events. And we love the surprises: all of these were very different kinds of events and ways of presenting the adventure of each design process. 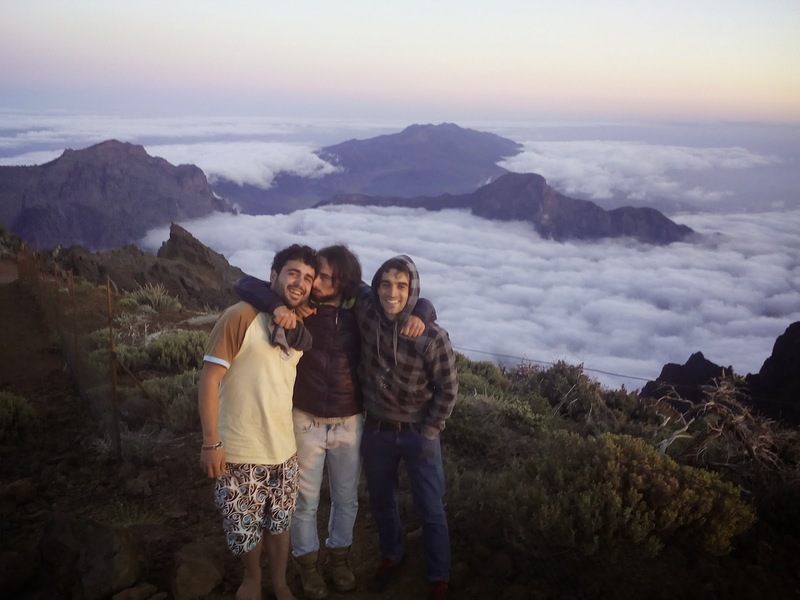 Fer and Daniele's ceremony included a trip above the clouds, to the Roque de los Muchachos. Congratulations for all your creativity and thank you everyone for sharing your process and results. 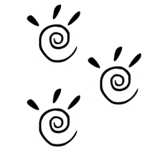 Welcome to the world-wide community of Permaculture designers!